Just click and send this Valentine�s Gift Basket conveying the warmth of your love to your lovely relatives residing far away. 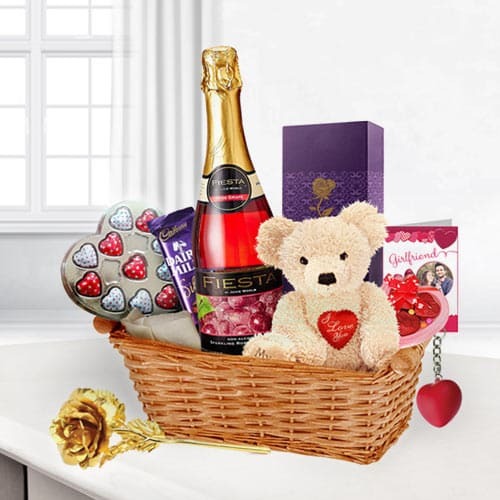 This Valentines Gift Basket provides everything you need such as Love Teddy with 3 heart, 11 pcs Heart Shape Homemade Chocolate, Dairy Milk Silk, Golden Rose, 3 pcs Heart Chocolate, Heart Shape key ring and Feista Sparkling Juice (red). All these items are elegantly stuffed in a Basket with Valentines Day Special Card.